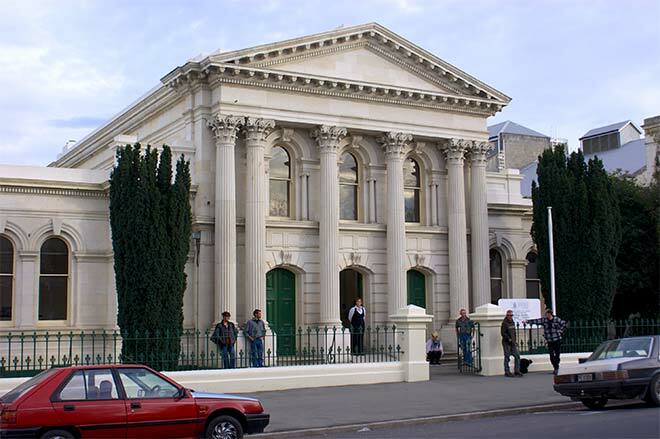 The Ōamaru courthouse, pictured in 2010, was designed by the local architects Thomas Forrester and John Lemon and opened in 1883. It was built of Ōamaru limestone in the classical revival style. Its street frontage featured a two-storey central portico with an ornate pediment and elaborate Corinthian columns. The building is regarded as the architects' best work and is among New Zealand's finest courthouses. In 2014 it was no longer used as a courthouse and the government was considering selling it.